Born and raised in Sacramento, California, Randy has had several careers in his lifetime. First as a Building Contractor, and then as a Maintenance Supervisor for a property management company. At age 40, knee injuries forced a career change and he attended Business College. He then climbed the corporate ladder to the position of Senior Accountant. Now that Randy and his lifelong friend Dave Wallin have retired from their professional careers, they have teamed up to tell a story that no one else can tell. A quick little phone call, just eleven words spoken, was all it took to change their lives and strengthen a bond that would outlast time. They were 24 years old at the time. Sometimes it’s the simplest things that last. Eleven Words is about what happened in their lives after Terry, Dave’s wife was brutally murdered by a serial killer. Eleven Words is available at: Amazon, iTunes, Barnes & Noble, Kobo and many other eBook locations. 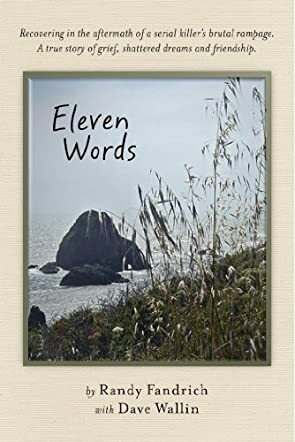 Eleven Words by Randy Fandrich is an insightful, touching, and caring story about the first seven days after a loved one is brutally murdered. Dave arrives home from work to find his wife dead. His best friend, Randy, quickly joins Dave and does his best to ease the awful pain. Together the two men spend the week arranging the details for Terry’s cremation and final resting place. Randy does the walk-through of the murder scene with the detectives to spare Dave, talks with the family, and visits the funeral home. Eleven Words was a sad story of a husband’s pain, a mother’s loss, and the impossible task of friends saying goodbye to a dear and special friend. Terry is a woman that everyone liked and her death is made even harder by the fact that she was expecting their first child. It is now thirty-three years later and Dave and Randy are still best friends. We learn of how each has survived and moved on from the terrible tragedy as they journey to the place where Terry’s ashes were scattered. Photographs of happier times are placed throughout the story, making them very real people. Randy Fandrich has written a one of a kind book. Eleven Words is a sad story of the pain of losing your wife unexpectedly and way too soon. Eleven Words is a story of true friendship and love between two friends. Eleven Words is a true story of a brutal murder. Randy Fandrich was able to convey the pain but also the love in a very real and touching way. This book is a good read.